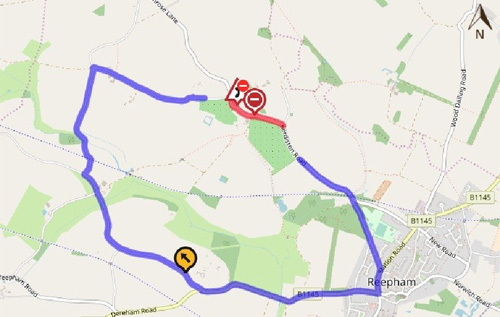 Kerdiston Road will be closed from its junction with Primrose Lane to its junction with Holly Lane in Reepham because of cabling works to restore customer service by BT Openreach. The road will be temporarily closed (except for access) from 24–27 September between 9.30 am and 3.30 pm for the duration of the works. The alternative route is via: Kerdiston Road, Forwater Road, Kerdiston Road, B1145 Dereham Road/Station Road, Kerdiston Road. The person dealing with enquiries at Norfolk County Council is Martin Dixon (Community and Environmental Services), telephone 0344 800 8020.